With a new approach to messaging and positioning, Avalon gave new life to the Rainforest Action Network’s appeal program. OBJECTIVE: Given the multitude of nonprofits working in the environmental sector, the Rainforest Action Network (RAN) needed a way to make its unique brand of activism stand out for donors. So Avalon sought to appeal to them with a fresh messaging approach and a strong case for support. STRATEGY AND AUDIENCE: Previous RAN appeals focused on the destructive environmental consequences of clear cutting rainforests—compelling, but missing the more human story. Our new messaging focused on the wildlife that is being impacted in the rush to produce cheap palm oil in the Leuser Ecosystem—the last place on earth where Sumatran tigers, orangutans, rhinos, and sun bears can still be found living together. Our window carrier featured a photo of an adorable baby orangutan and its mother, with the teaser “Don’t let your snacks destroy their future…” The two-page letter from RAN Executive Director Lindsey Allen got right to the point—engaging donors with the stark truth about the devastation to the rainforest and the animals that live there that results from harvesting palm oil for our snack foods. We challenged RAN donors to do something about this situation, then provided two solutions: one, sign the enclosed petition to PepsiCo, a leading purchaser of “conflict” palm oil; and two, make a contribution to support RAN’s campaigns to end rainforest destruction. The full-page reply form echoed the letter’s urgency and important message, and included a three-paragraph petition to PepsiCo outlining what’s at stake and imploring the company to do the right thing. 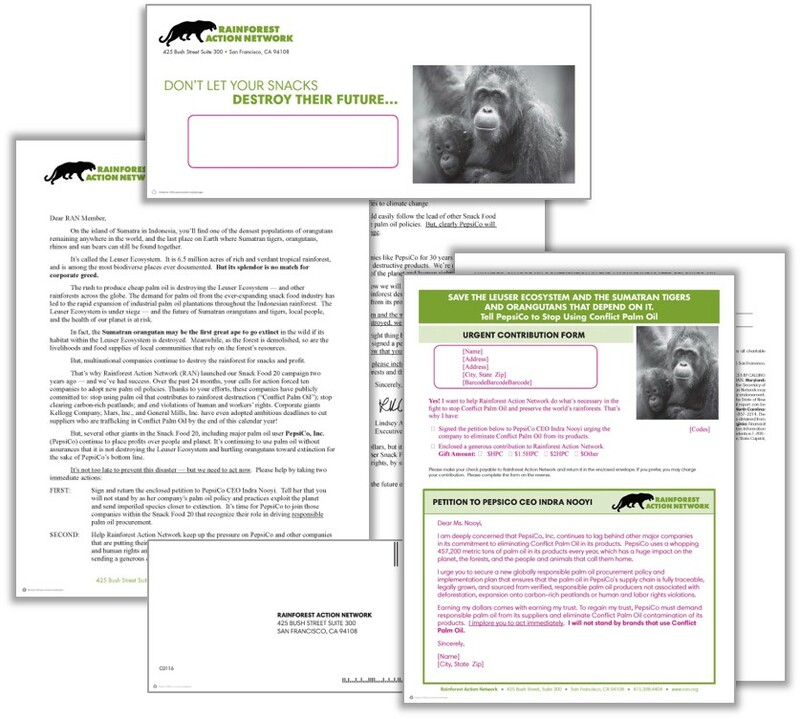 We mailed the Leuser appeal to all of RAN’s 0-24-month active donors. RESULTS: Our shift in messaging focus resulted in spectacular returns, with a response rate twice what we budgeted and 96% higher than the fiscal year average. Clearly we hit a nerve among RAN’s donors, who feel a strong commitment to protecting rainforests and their wildlife from multi-national corporations producing palm oil for our snack foods.